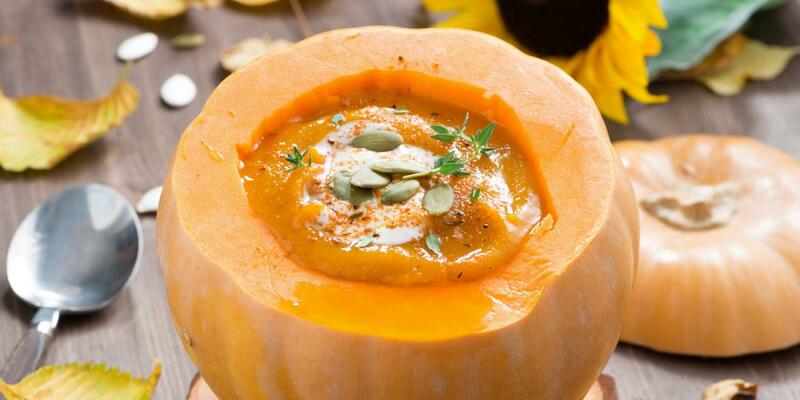 Try this pumpkin soup with a festive pumpkin bowl at your next fall feast. Recipe provided by Itsy Bitsy Foodies. Slice the tops off of the pumpkins you would like to use as bowls. The size of the pumpkins will vary depending on whether you will be serving the soup as an appetizer or a main course. Scoop out the flesh and seeds of the pumpkins. Reserve the seeds to toast as a garnish or as a snack. Sprinkle 1/2 tsp salt and sugar on the inside flesh of each pumpkin. Heat 1 Tbsp butter in a large pan over medium heat. Add the chopped leek and cook it for 5-7 minutes or until soft and tender, but not browned. Add the pumpkin/squash purée and 2 cups of chicken broth. Then purée it in a blender until smooth. Return the pumpkin/squash mixture to the pan. Add 1 cup chicken broth, salt, black pepper and curry powder (if desired). Add additional chicken broth if you want a thinner soup. Heat the soup through and serve it in warmed bowls or pumpkin tureens. Garnish the soup with roasted pumpkin seeds, croutons or chopped cilantro.